PRODUCER MAKES SHOCKING REVELATION ABOUT BAAHUBALI 2 VFX! 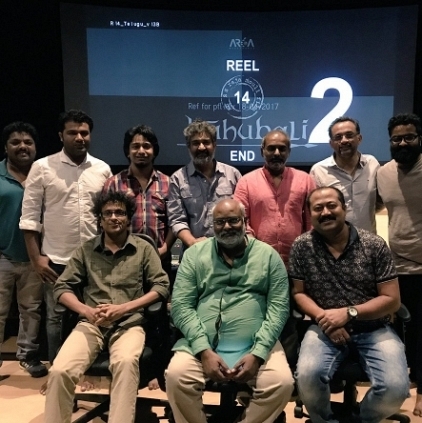 The five-year travel of Baahubali is coming to an end, and the entire team is very emotional about it. Producer Shobu Yarlagadda was seen tweeting about his experience of working in Baahubali and thanking everyone who was part of the team. "Waking up to a strange feeling of not having much work to do! Didn't experience this in a very long time! @BaahubaliMovie @ssrajamouli. The fact that WE got @BaahubaliMovie 2 ready in time for April 28th release is nothing short of a miracle ! Many many thanks to each n every one of you who worked without much sleep over last few weeks to make this happen! You know who you are !Editing, VFX, Sound, Music, Dub, DI/Color from many studios n top talent fell in place over the last few weeks to complete @BaahubaliMovie 2 Just to give an idea of the " miracle" I am talking about ..in the last few weeks VFX teams delivered over 1300 shots!And all I can say to each n everyone of you who were part of this journey called #Baahubali is "Thank You"." The Theri man and three heroines for Vijay Sethupathi's landmark film! Unknown new facts about Vivegam! Breaking: Amala Paul out of Vada Chennai! Who has replaced her? S.S.Rajamouli's Baahubali Gets Postponed Yet Again To July. People looking for online information on Baahubali 2, S.S.Rajamouli, Shobu Yarlagadda will find this news story useful.